Douglas Lake, Tennessee is conveniently surrounded by Highways 441 and 411 and I-40, thus making it very convenient to enjoy living, working and playing here. Local residents will tell you this is a great place to live, tucked in the foothills of the majestic Great Smoky Mountains. The fish are always biting, the weather is close to perfect, and the people represent the best friendly, southern charm. Douglas Lake, with a maximum depth of 140 feet, is surrounded by gentle rolling hillsides that provide an ideal setting for residential homebuyers wishing to enjoy the good life. Douglas Dam was built during World War II and is significant to the Tennessee Valley for not only providing hydropower, but supporting the war effort. The construction of the Dam itself set world records in 1943; it was completed in 12 months and 17 days. Douglas Dam provides a reservoir that is 43 miles in length for the residents of Sevier County and the surrounding areas to access. The Dam itself is 202 feet high and 1,705 feet long. Douglas Dam provides residents with two overlooks that have beautiful views, benches, picnic areas and grills. For boating enthusiasts there are a variety of marinas serving Douglas Lake that offer full-service amenities including boat rentals, slip rentals, dry storage, boat repairs and restaurants. 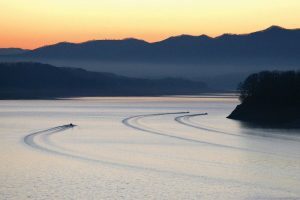 There is nothing more relaxing than a day of sailing or power boating along the waters of Douglas Lake backdropped by the Great Smoky Mountains in every direction. Nearby Sevierville, Pigeon Forge and Gatlinburg provide action-packed entertainment and family attractions, while Douglas Lake offers a different kind of entertainment. Residents can enjoy boating, water sports, fishing, bird watching, camping, swimming and horseback riding. Douglas Lakeview Stables, in the foothills of the Great Smoky Mountains, offers trail rides with views for 40 miles around more than 30,000 acres of Douglas Lake and the surrounding Cherokee Valley. As a large man-made lake fed mainly by the French Broad and secondarily by the Nolichucky and Pigeon Rivers, Douglas Lake has approximately 550 miles of shoreline and averages over 1.5 million visitors annually. Despite the popularity of the lake, homeowners and avid boaters can still find peaceful coves and secluded hide-a-ways to enjoy the serenity of this lake paradise. Fishing is probably the most popular sport on and around the waters. Every fisherman has a dream of Catching the Big One, and Douglas Lake can make that dream come true. Douglas Lake has been rated as one of the top 5 crappie fishing lakes and top 10 large mouth bass fishing lakes in the nation. And those are just two of the species waiting for your lure throughout the year in Douglas Lake! The majority of the property surrounding Douglas Lake is privately owned and offers homebuyers every style of home available and countless amenities. Waterfront homes, water view homes, lake cabins, condos, gated private estates, lake access homes, lots and acreage, secluded single family homes and subdivisions surround this serene, yet active setting. Right off I-40 at the intersection of Highways 92 and 139, at the shores of Douglas Lake, is Dandridge, Tennessee. Dandridge is located in Jefferson County and home to nearly 5,000 full-time residents with homes surrounded by native mountain laurel and Rhododendron shrubs. Dandridge is one of the finest Tennessee Valley locations for lake living all within a short scenic drive from the never-ending fun filled mountain towns of Gatlinburg and Pigeon Forge as well as the Great Smoky Mountains National Park. Dandridge is historically significant for being debatably the second oldest town in Tennessee, settled in 1783. It is also proud to be the only town in the nation named after First Lady Martha Dandridge Custis Washington. 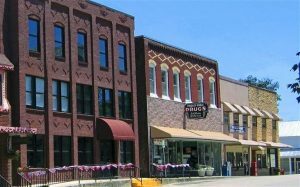 The history of Dandridge can be seen in the downtown area, which in its entirety, is listed on the National Register of Historic Places. Lining the historic streets of downtown Dandridge are century-old homes, inns and taverns, with many historic homes housing local businesses. Dandridge is the official county seat of Jefferson County and proud home of the Jefferson County Museum, located in a courthouse dating back to 1845. Residents enjoy an average annual temperature of 56 degrees and year-round beautiful views from lakefront cabins, condos and single family homes gracing the shores of Dandridge and Douglas Lake. Young residents are educated in the fine schools of Dandridge and Piedmont Elementary, Maury Middle, and Jefferson County High School. The Point Resort is a local favorite for fine dining at its restaurant of the same name. The Point Restaurant offers traditional favorites, nightly live entertainment, indoor and outdoor dining with unbeatable views of the stunning Dandridge area. The Point Marina offers residents a full service marina with wet and dry storage, ramp access, and boat service. Golf is another favorite pastime in Dandridge, and one of the top locations for tee times is the Dandridge Golf and Country Club. Set among rolling hills, valleys and woodlands, this unique 27-hole course offers never-ending vistas of the Great Smoky Mountains and the waters of Douglas Lake. Economically, Dandridge is a great place to call home. Four of the top Jefferson County employers are located in the town of Dandridge Bush Bros. & Co., Ball Food Container Corp., Hearthstone Inc., and Lilford Manufacturing. With a strong central force in the local government and support for the local economy, the Dandridge real estate market remains strong with homes ranging from affordable, modest homes to sprawling multi-million dollar estates. Residents of Dandridge enjoy views of English Mountain that showcases steep ridges and rocky cliffs that are untouched by local development. English Mountain produces sparkling drinking water that is transported around the country by the English Mountain Bottled Water Company, at the base of this spectacular mountain in Dandridge. Imagine traveling by hot air balloon over Dandridge, spending your days relaxing by the glistening waters of Douglas Lake, or fishing and skiing in quiet coves surrounded by the blue mist of the Tennessee Valleys. Dandridge is the ideal location to do just that, and more. It is arguably one of the top choices for lake living in the eastern valleys and foothills of Tennessee.